PORTLAND, OR — Global biogas upgrading specialist, DMT, has produced 9 billion cubic feet of renewable natural gas (RNG) worldwide—enough green gas to heat 227,000 homes and power thousands of vehicles. 30 international plant operators to date use DMT’s Carborex® MS—a biogas to pure methane system with advanced membrane technology. What are the global impacts of these projects and what does this mean in terms of reducing greenhouse gas emissions? As of the 1st of November, Stephen McCulloch is appointed Business Director for DMT Environmental Technology to cover and further develop the UK market. The prime goal is twofold: Stephen is going to grow the market for resource recovery and strengthen DMT’s service ability for current biogas upgrading projects. “I believe joining DMT as UK Business Director, brings together the perfect partnership of experience and market intelligence”, according to McCulloch. 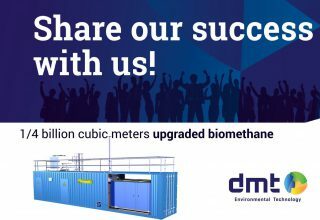 DMT Clear Gas Solutions, a global biogas and landfill gas upgrading solutions provider, will install the first biogas upgrading system using high selective membranes in Hawaii. The gas utility, Hawaii Gas, has selected DMT Clear Gas Solutions as their technology provider to build the biogas upgrading plant at the Honouliuli Wastewater Treatment Plant (WWTP). DMT Clear Gas Solutions is going to provide the upgrading technology for a waste to resources facility in Utah. As we posted earlier we are very proud that the selected technology is DMT’s Carborex®MS. This technology uses high selective membranes to clean the raw biogas to RNG, Renewable Natural Gas. For more information please also follow this link.